Sophia was absolutely incredible! After a bit of a bad experience with a different vendor, I reached out a bit late to Sophia who was completely a breath of fresh air. 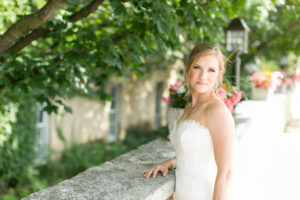 It was only about a month before the wedding when I contacted her and I went out on a whim–her work looked so incredible I thought she surely would be booked. It turned out that she was available and she has been just absolutely the best to work with the entire time. Sophia is extremely organized and she got back to me very quickly–including the initial booking, questions that I had, appointments, etc. She worked around my last minute schedule as well and was so helpful the entire time. I picked Sophia because I could tell from her website that she not only had great skill, but she was so TALENTED because she could apply that skill to different looks. So many times a makeup artist has only one look they try to push on everyone–not the case at all with Sophia! She listened to what I was looking for, asked a few questions, looked at some photos that I showed her and she really got a feel for what I was going for. Her products are CLEAN and they are great QUALITY products. At my trial, she also was very professional about letting me know that she wanted my feedback and if there was anything I didn’t like about the look, she could change it. She is extremely professional. This carried over to the wedding day as well–she showed up on time, was extremely organized, and was just such a pleasure to work with–and to hang out with! She is so kind and easy to get along with–it made wedding prep and wedding day a breeze! When it came to the wedding day, there were a few bridesmaids that did not want makeup done–once they saw her doing makeup and how skilled she was, one of the girls requested to get her makeup done as well if there was time–and it looked amazing! She was so happy with her look–not cakey or overdone. Sophia really knows how to tap into your individual beauty and highlight your best features! And I can’t forget about Natalie! She did my hair and was absolutely incredible. She also is extremely talented–she can do so many different looks and is so easy to work with. I described my look with her and she was also just the most professional, kind, and talented hair stylist I have ever had the pleasure to get my hair done by. She really listened to the look I was going for and I couldn’t be happier with my look. I can echo the same for the bridesmaids as well–I didn’t have any restrictions or “type” of a hairstyle that I wanted for them, so Natalie spoke with each bridesmaid to find the best look for their style! Hairstyles varied from modern edgy looks, sleek updo, to a style with hair down. I can also say for both Sophia and Natalie that their looks were tailored to each person. Both of the “moms” had their makeup done as well and one had hair done–and the looks were just so elegant and gorgeous. These two really know how to bring out the beauty of the individual without making them look overdone. They are able to do looks that are age appropriate and looks that each person is comfortable with. I cannot recommend Sophia and Natalie enough! They will be my first recommendation for anyone looking for hair and makeup. They are the epitome for impeccable customer service and talent in the wedding industry!